According to your LinkedIn, you’ve had an impressive history of recruiting young people to agriculture. Why is this important to you? Where I grew up, opportunities don’t really come knocking because no one has ever built a door. We’re in an incredibly rural part of South Dakota; while we’re rich in both human and natural resources, we’re suffering from the symptoms which centuries of poverty has inflicted and most often it’s our youth that suffer the most. In my outreach and advocacy for careers in agriculture, I put my energy towards helping our young people realize that the wide-open spaces we call home are not just “the middle of nowhere.” Instead, I want them to look around their home and to see resources, which have the potential to grow food, which can in turn feed their family. There’s a whole lot of pride that comes with being responsible for something as beautiful as our landscapes. I’ve learned that with just a little effort, I can inspire young people to believe in themselves as much as they believe in agriculture. What should the world know about your story? My story looks the way it does as a result of many people offering me an opportunity that I felt comfortable and confident in pursuing. I could not be where I am today, had it not been for many generations of sacrifice, hard work, and support. I strive every day to carry out my story in a way that can help to put others in a place they are proud of, like I am fortunate enough to experience. What is the mission of the Intertribal Agriculture Council? How did you get involved in this organization? The mission of the Intertribal Agriculture Council is to provide a unified effort to promote change in Indian Agriculture for the benefit of Indian People. IAC programs further the goal of improving Indian Agriculture. The IAC promotes the Indian use of Indian resources and contracts with federal agencies to maximize resources for tribal members. The IAC has been at the forefront of engaging youth in Indian Agriculture, and it captured my attention when I was still in high school. I attended my first annual IAC Symposium as a junior in high school. I still remember the moment that I decided these are the people I want to spend my career working with. The IAC was committed to providing access to professional development opportunities as I sought my college education., It’s been a dream come true joining them in full employment after achieving my undergraduate degree. I tell people every day that I have the very best job in the world. Tell us about your work as youth programs coordinator and natural resource director at the Intertribal Agriculture Council? What are some specific projects you work on? How does your work intersect with the USDA? Since 2015, my work with the Intertribal Agriculture Council has allowed me to engage with over 550 native youth from more than 150 tribal nations. Most of this interaction takes place at the regional youth leadership development events which the IAC works to coordinate. Our one-of-a-kind youth leadership development opportunities expose youth to land conservation and stewardship, traditional food preparation and preservation, agricultural production planning, entrepreneurial business ventures in food and agriculture, and resource management as a community development tool. These events are building intertribal collaborations and national networks which will be the source for life changing impacts for generations to come. When I tell people, I have the best job in the world, I mean it. Every day I get to work at the crossing of Tribal land stewardship and native youth leadership development. In my job, I share the vast opportunities that exist for native peoples in the field of agriculture. From economic development to improving food systems, from cultural preservation to utilizing technological advances; agriculture has the ability to bridge the largest gaps in Indian Country. In so many of our native communities, access to our historical food systems and agricultural production patterns has been restricted for long enough that we’ve forgotten what they look like. 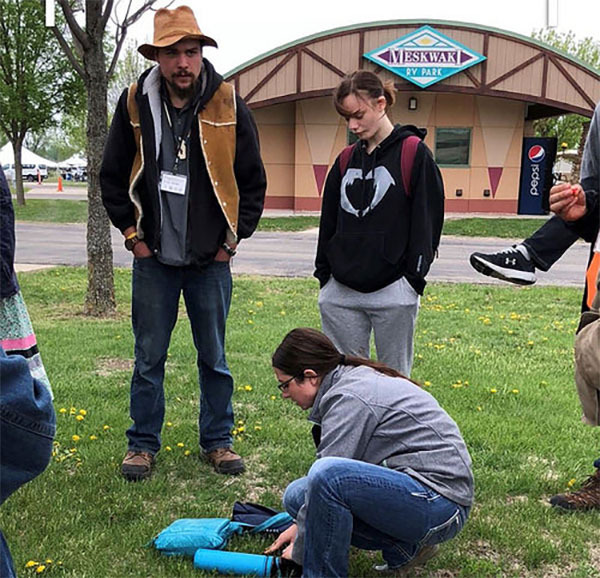 In my work I get to experience community development driven by reconnecting native youth with holistic agricultural development. I’ve realized that a change led by youth is more sustainable. I know that our outstanding network of youth is going to be largely responsible for the greatness we will experience in the years to come. What personal challenges have you encountered as a woman in ag? How did you overcome them? I consider myself incredibly fortunate in many ways, but one that stands out is my upbringing as a woman in agriculture. I was raised on a ranch where being a girl was considered my strong suit, rather than being viewed as my weakness. In many native societies, familial structure follows a matriarchal organization. Following suit, my family raised me to work alongside the men in any job. As I ventured into my career, my biggest challenge was realizing that other societies tended to view women in agriculture as less superior. My parents raised me to be aware, diligent, stubborn (sometimes to a fault), and empathetic, which has allowed me to be comfortable in any arena I dive into -- even if it is a male dominated field. I’d sure hate to imagine where I’d be in life without my large, supportive family! One of my largest role models is my mother. Her tenacious, compassionate heart is one I’ll strive every day to mimic. My brother and sister came along right when I needed someone to look up to me and they are the spark which ignited my desire to help youth. In the work that I get to do now, I meet many inspirational young minds and I find that the average age of my role models continues to drop. Our young people are so creative, innovative and caring. What advice do you have for young women interested in agriculture? What’s the best advice you’ve received? As a young woman interested in agriculture, I find it incredibly crucial that we find ways to challenge the status quo. It must be our job to seek more efficient, harmonious ways to work with the land and its resources. There will be many trials to overcome, so don’t be afraid to take that leap of faith. In these instances, the grass really is always greener on the other side! I also want to encourage young women to take pride in their work. When you’ve witnessed an accomplishment, share it! Especially when you’re the one reaching that milestone. Remember that once you’ve climbed the ladder of success there’s almost always someone that doesn’t have the capacity to reach that bottom rung. It is your job to climb back down and help others find their way to the top to enjoy the view alongside of you. Where do you see yourself in five, ten and twenty years and how do you hope to get there? I honestly couldn’t imagine myself in a better place than where I am at currently. I’d like to think I’m spending most of my days on horseback alongside my family and friends, still enjoying a career that uplifts rural agriculture, Indian Country and most importantly, our youth! What was it like being the first Native American student to give the student address at the commencement ceremony at South Dakota State University? There are some moments that words just can’t describe. This is one of them. As the first Native American student to have such an opportunity at South Dakota’s Land-Grant University, I felt as though I had played a hand in claiming new territory. Higher education is not nearly as attainable as it should be for youth, especially those of Indian Country. I witnessed the stage as a platform to advocate for what is attainable for native youth back home. Since my graduation, it’s been so rewarding to witness SDSU President Barry Dunn’s Wokini Initiative reveal a more culturally appropriate approach to inspiring our youth to pursue higher education. It is an exciting and inspirational time throughout Indian Country. In my travels around the country, I’ve learned to view agriculture as societies surviving in harmony with the land and its resources. To me, agriculture is the act of caring for the land which we are borrowing from our children. Any work that we do on, to, or with the land, should be done in a way that leaves a healthier ecosystem in our wake. Youth need to be recruited to be soy farmers, not part of an unsustainable, unhealthy, and cruel industry.